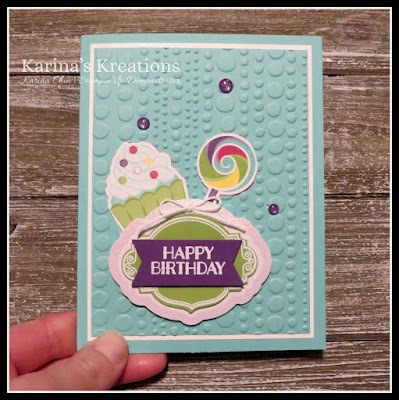 The Stampin'Up Sweetest Thing Bundle makes gorgeous cards. In fact the whole product suite is gorgeous and coordinates perfectly with each other. The cupcake and lollipop were cut out from the How Sweet It Is Designer Series Paper Pack. No stamping required. I stamped the frame with Versamark ink on Granny Apple Green card stock and embossed it with White embossing Powder. It was then attache to a tag from Sweet Pins and Tags. You get 24 tags in a package. TIP: What about the enamel glitter dots? They are from the annual catalog and come in 4 yummy colors which also coordinate with this product suite. I embossed the sentiment on Gorgeous Grape card stock. The back ground is embossed with the Dot to Dot Textured Impressions embossing Folder. Here's the supply list for my card. Want the supplies? 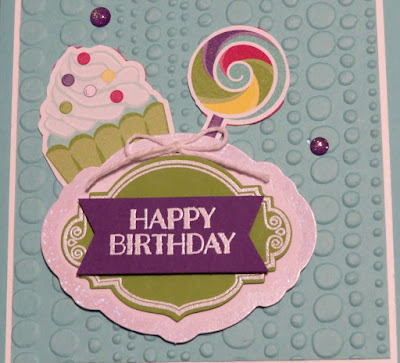 Click on one of the pictures to go to my Online Stamping store.